The PredictionConfidenceInterval object contains confidence interval results for model predictions (that is, simulation results based on estimated parameters), computed using sbiopredictionci. ci = sbiopredictionci(fitResults) computes 95% confidence intervals for the model simulation results from fitResults, a NLINResults object or OptimResults object returned by sbiofit. 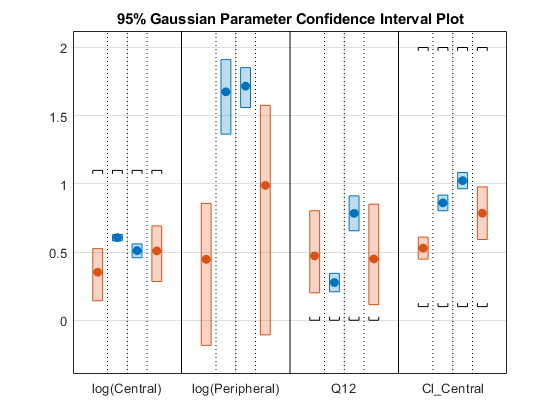 ci is a PredictionConfidenceInterval object that contains the computed confidence interval data. ci = sbiopredictionci(fitResults,Name,Value) uses additional options specified by one or more Name,Value pair arguments. Example: 'Alpha',0.01,'Type','bootstrap' specifies to compute a 99% confidence interval using the bootstrap method. 'gaussian'– Use the Gaussian approximation of the distribution of the linearized model responses around the parameter estimates. Level of display returned to the command line, specified as the comma-separated pair consisting of 'Display' and a character vector. 'off' (default) or 'none' displays no output. 'final' displays a message when the computation finishes. 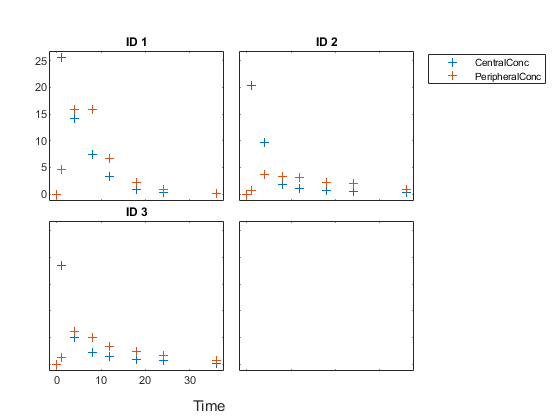 If the input fitResults is a vector of results objects, then the computation of confidence intervals for each object is performed in parallel. 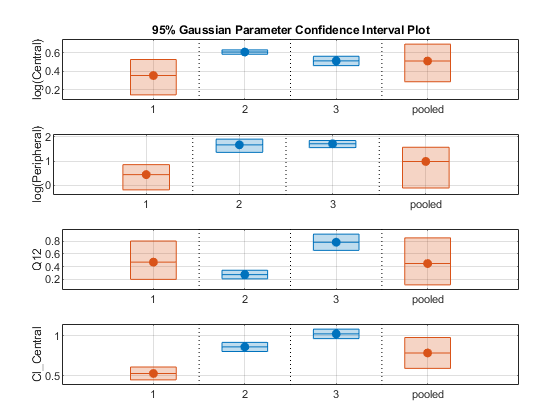 The Gaussian confidence intervals are quick to compute. So, it might be more beneficial to parallelize the original fit (sbiofit) and not set UseParallel to true for sbiopredictionci. 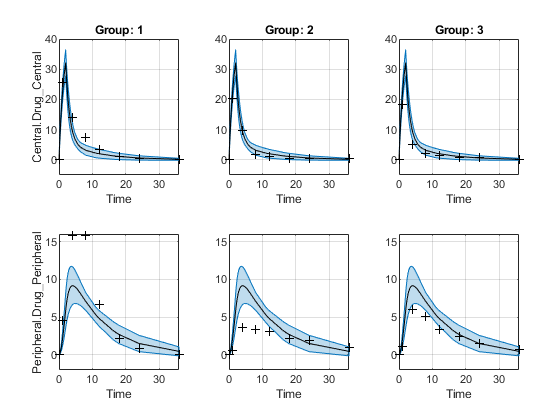 If you have a global stream for random number generation with a number of substreams to compute in parallel in a reproducible fashion, sbiopredictionci first checks to see if the number of workers is same as the number of substreams. If so, the function sets UseSubstreams to true in the statset option and passes to bootci. Otherwise, the substreams are ignored by default. Names of model responses in the parameter fit, specified as a cell array of character vectors. Each cell contains the name of a response. success – The proper confidence intervals are found. That is, no model prediction is constrained by the parameter bounds defined in the original fit. 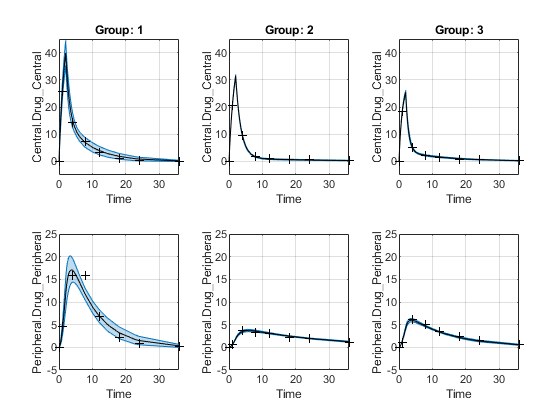 constrained – The confidence intervals are found, but the confidence interval for the model response is constrained by a parameter bound defined in the original fit. not estimable – No confidence intervals are found. estimable – The proper confidence intervals are found, but other model predictions have an estimation status of either constrained or not estimable. For the bootstrap confidence interval, the status is always set to estimable. 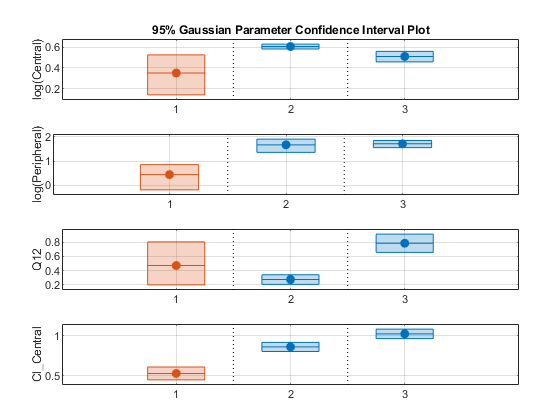 For details, see Gaussian Confidence Interval Calculation for Model Predictions and Bootstrap Confidence Interval Calculation. 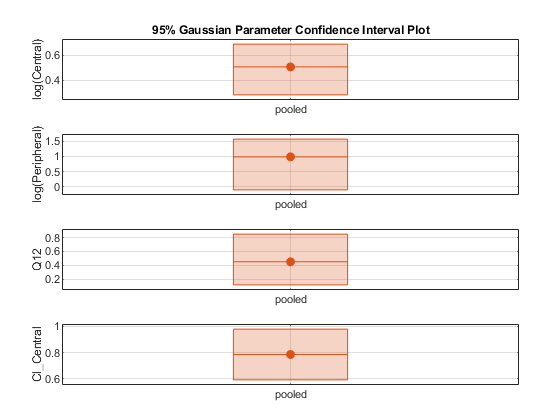 Confidence interval type, specified as 'gaussian' or 'bootstrap'. Confidence level, (1-Alpha) * 100%, specified as a positive scalar between 0 and 1. Original group names from the data used for fitting the model, specified as a cell array of character vectors. Each cell contains the name of a group. Confidence interval results, specified as a table. The table contains the following columns. Exit flags returned during the calculation of bootstrap confidence intervals only, specified as a vector of integers. Each integer is an exit flag returned by the estimation function (except nlinfit) used to fit parameters during bootstrapping. The same estimation function used in the original fit is used for bootstrapping. Each flag indicates the success or failure status of the fitting performed to create a bootstrap sample. Refer to the reference page of the corresponding estimation function for the meaning of the exit flag. If the estimation function does not return an exit flag, ExitFlags is set to . For the gaussian confidence intervals, ExitFlags is not supported and is always set to .